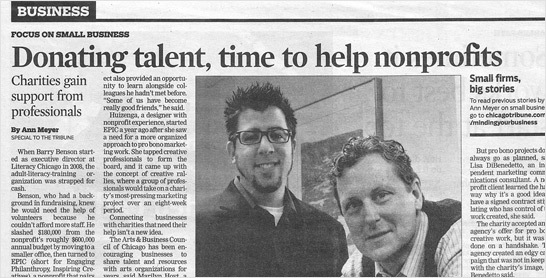 Part of Hexanine’s core value is to give back in meaningful ways, using our time and expertise to help others. We’ve mentioned before the great work that Erin Huizenga’s EPIC organization is doing, and our part in it. We talked with Chicago Tribune “Minding Your Business” columnist Ann Meyer about the experience of working with Literacy Chicago during an EPIC creative rally. Print version of article with photo. Well done, my friend, well done! It is great to see so many designers and other creative-minded folks getting involved with something as awesome and inspiring as EPIC. Sorry this is late but the first time I actually saw the article. Kudos! That is really great!